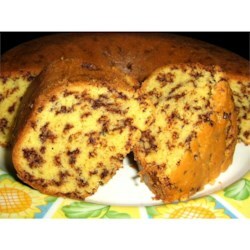 "Pound cake recipe that uses cake mix as its base. Works well for wedding cakes. Use any flavor cake mix." Preheat oven to 350 degrees F (175 degrees C). Grease and flour 9x13 inch pan. In a large bowl, combine cake mix, pudding mix, oil and water. Beat until moistened. Add eggs and beat well. Add flavorings. Beat 6 to 8 minutes on medium high speed. Batter will be very thick. Pour into prepared pan and bake at 350 degrees F (175 degrees C) for 40 to 45 minutes or until tester comes out clean. Good texture. Other than that, just a glorified yellow cake mix cake. Excellent flavor and texture! I've been trying out several recipes for wedding cakes and so far this is one of my favorites. Very moist! Absolutely love this recipe! I've made it for guests and friends, and get rave reviews every time. I'm nearly hesitant to part with my 'secret,' but it's just too good not to share. Thanks!